* Trigger lock for safe blaster control. * Efficient easy-load magazine for faster action. * Tactical rail for greater control. * Blaster color variety for the advantage of choice. * Convenient priming handle for easy reloading. The powerful effect of the spring-action blaster attests to the formidable performance of the Nerf Rival Apollo XV-700. Clearly, this gun reflects the designer’s intention to surpass average standards. The gun has the capacity to fire fast and precise shots over incredibly long distances. The quality of consistency ensures that the gun remains in top-form condition for a long time without requiring repairs and adjustments. Many users have roundly appreciated the way the Apollo XV-700 responds promptly to its controls. On nearly every account, Apollo’s performance is above average. The quality of a good toy gun is largely measured by the impact of its rounds. The profundity of strength in this gun manifests in the enhanced impact of its rounds, particularly as they hit hard and distant targets. The gun fires its rounds with terrific force and astonishing precision. There is a way in which its performance and power shows a measure of performance that closely mimics the real thing. In fact, it is necessary for the gunner to guard against the immense ricocheting effect of the balls. In this sense, the Nerf Rival Apollo stands out as a credible example of the advances in the toy gun technology. 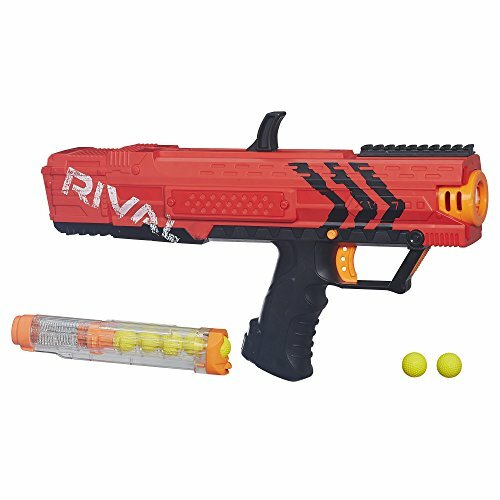 Every child should appreciate the Nerf Rival Apollo because of the ease with which its magazine is switched and loaded. The efficiency of a good toy gun is partly determined by the nature and functioning of its magazine. According to various Nerf Rival Apollo XV-700 reviews, a good magazine should load fast enough to allow you to concentrate on the crucial aspects of the action. Guns with difficult magazines are generally cumbersome to operate because you spend a lot of time managing the technical details instead of focusing on the field manoeuvre. The easy-load magazine of this gun makes it appropriate for highly competitive actions. Generally, avid toy gunners prefer to play with high velocity guns because they stir up their adrenaline, which helps them achieve a full immersive action. Amazingly, this toy gun fires its rounds at an astonishing velocity of about 30 mps. Truly, it is hard to find an equivalent or one surpasses such performance. Firing far and hard requires advanced technical details that sustain the in-built force and the recoil velocity. In both aspects, this gun remains one of the best that you could find in any toy shop. A 14-year old boy is bound to love this gun because of the aggressive velocity, particularly during moments of intense action. Nobody wants to compete with a toy gun with questionable accuracy. While in the field of play, the ability to strike the target where it matters is the most important determinant of the gunner’s chances of success. The designers of the Apollo XV-700 ensured that the spring-action blaster and the high-impact rounds work in perfect harmony to deliver awesomely accurate shots. The sheer intensity of its velocity also helps to maintain the rounds on the projected course, which is necessary to guarantee utmost accuracy. On comparative terms, this gun comes very close to some of the most accurate toys on the market. One way of telling the quality of a good gun is to look at its handle. A high quality gun is usually designed with a strong handle that offers a firm grip for easy manipulation. The Nerf Rival Apollo toy gun has a strong and firm handle that ensures higher levels of accuracy and comfortable manipulation. The handle is big enough to fit in the palms of an average user although concerns abound regarding the inappropriateness of the size in the small hands of the underage users. On fair terms, this gun was intended for the comfortable handling and manipulation of the average user. * Without sufficient safeguards, high ricocheting of balls could harm gunners or others around the target area. * It may be irritatingly loud if your ears are highly sensitive, but earmuffs can help moderate the effects. Hint: click or tap the stars for the most helpful Nerf Apollo XV-700 Amazon reviews. Nerf Apollo XV-700 mod kit & step-by-step guide coming (very) soon. Click here to be the first to know when it's ready! Nerf Apollo XV-700 range test coming soon! Get the Apollo XV-700 Mod Guide!